Don’t forget folks, it’s only just over a week ’till our nice relaxing bicycle ride to the beaches of Weymouth and Portland. 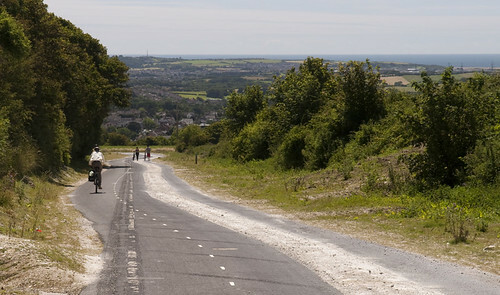 On the morning of Saturday 18th we’ll gather in Dorchester ready to follow the 12km (7.5 mile) Olympic cycleway to the seaside, and then perhaps have a look at some of the other infrastructure in the town. 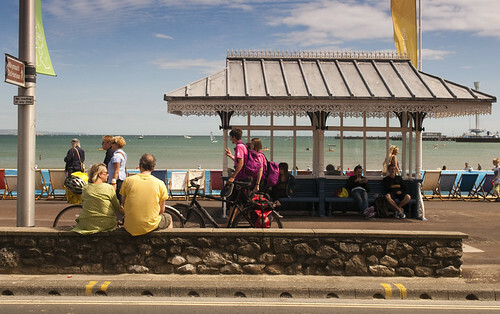 The original plan was to meet at Dorchester South station for the 11:52 arrival from Waterloo, but due to requests from those with connections, we’ll hang around just long enough (and not a second longer — we’ve a lunch at the seafront to get to!) for those on the 12:04 arrival to join the back of the pack as we set off. That’ll also give loads of time for those travelling from Bristol/Bath to make the short journey over from Dorchester West station. Back in August, Jim led a successful seaside safari in Worthing and Brighton, on which we looked at the good, the bad, and ugly bits of south coast infrastructure for cycling… while, of course, having a nice leisurely bicycle ride beside the beach in the sunshine. Despite the latest easterly’s feeble attempts at bringing us one last delivery of snow and ice, it can not be too long before we have to start thinking again about days out on the south coast. 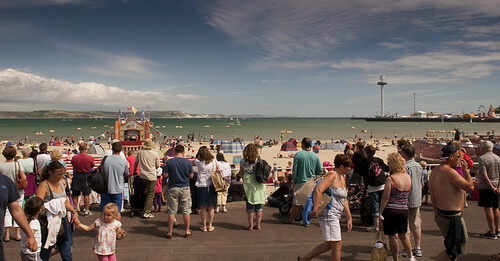 I am therefore proposing a seaside safari to Britain’s sunniest town and original seaside holiday resort: Weymouth. Weymouth could be an interesting little case study for infrastructure: a somewhat smaller town than those we’ve visited on previous safaris, with the inter-urban Olympic cycle track on the main road into the town and, like Bristol, a growing network of away-from-road multi-user paths, including the Rodwell Trail railway path. It also has some infrastructure on hills. I’m proposing Saturday 18th May (while folk at the other end of the island are Pedalling on Parliament), meeting at Dorchester South at 11:52, for the (6 full-size bicycles per train) arrival from Waterloo. 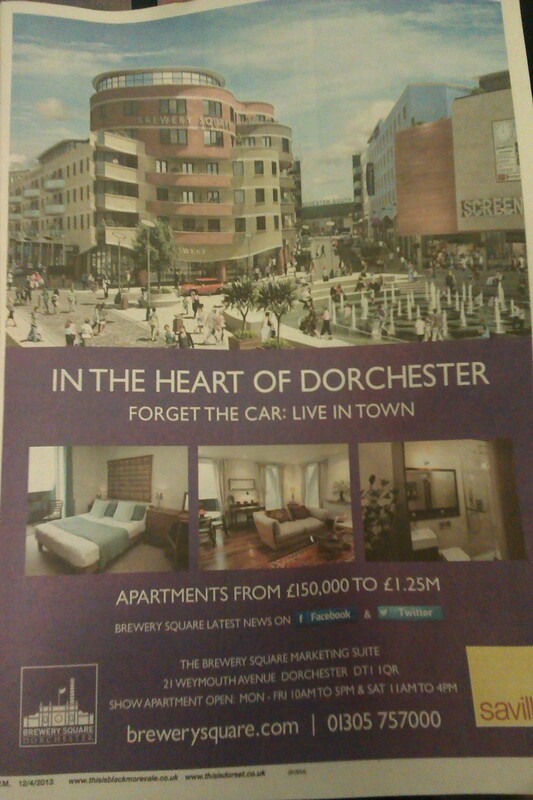 Folk travelling from or through Bristol would arrive five minutes earlier a couple of hundred yards away at Dorchester West. We’d spend an hour or two — depending on how fascinated everyone is by the infrastructure design — covering the 7.5 miles / 12 kms of mostly traffic-free route to the sea front for lunch, followed by options for further rides (probably the Rodwell Trail out to Portland Harbour and Chesil Beach), ending at a pub near to Weymouth station, or else the option for folk to split off for their own family afternoons with the Punch and Judy shows on the beach. But that’s only if enough people express an interest. Is anybody interested? Update: I have had sufficient interest here and on twitter/email/etc to give the go ahead exactly as described above. 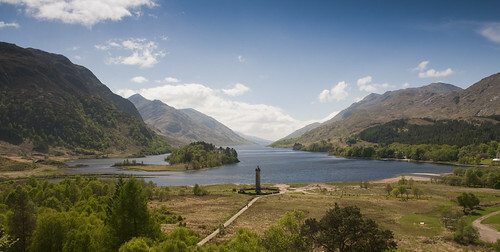 And cheap advance train tickets have just gone on sale today. If you want to reserve bicycle spaces with your ticket, I’d buy from the East Coast website. Though those with railcards (including the Network Card) might find that a flexible walkup ticket is not a bad deal on the weekend. 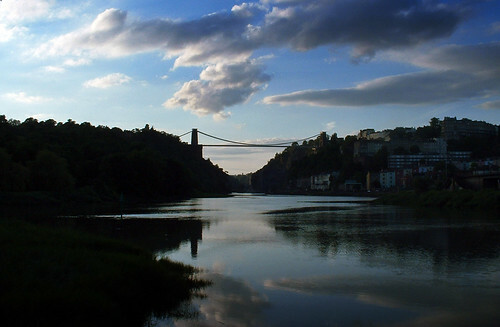 I promised to write up the other infrastructure safaris that the Cycling Embassy took while in Bristol for the AGM in May. David Arditti blogging about the safaris prompted me to get on with it. Previously I showed you the Railway Path. 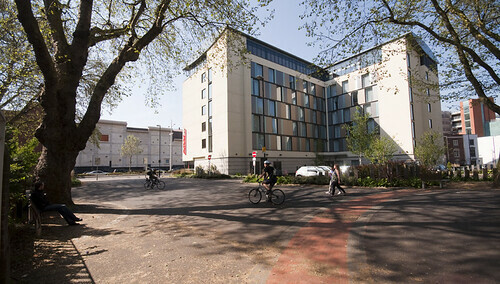 Left to come are a couple of rough and rambling posts, accompanied by Google Earth infrastructure safaris, on Bristol’s arterial cycling infrastructure (below) and city centre streets, hopefully leading to the properly thought out post that will eventually get to the point. So on the Sunday morning safari we looked at the options for utility cycling between the city centre and residential and commercial neighbourhoods in the north of the city. As before, for the details, pictures (mostly Mark’s and David’s) and video, it’s recorded as a virtual tour to be taken in Google Maps or downloaded for Google Earth: here is the Google Map tour. The basic context is that we rode from the city centre through 5km of residential neighbourhoods until we hit the outer ring road. The latter is late 20th century car territory — motorway junctions sending out tentacles of dual carriageway distributor roads to roundabouts around which car oriented commercial development grows. Much of the British aerospace industry, a major Ministry of Defence office, retail and logistics businesses, offices and R&D for tech companies, and a large university rise from a sea of car parks out here in the “North Fringe”, just outside the city boundary in South Gloucestershire, where the council allows that sort of thing. The route we were looking at was therefore one of important traffic flows: two centres of employment (and culture and retail and education) and the residential neighbourhoods they serve. There are several different arterial routes serving this traffic: of road, rail and cycleway. 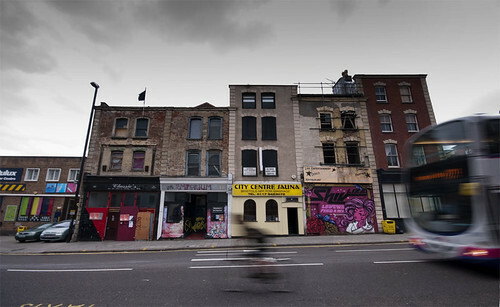 We headed north on the original artery — the traditional main road, the A38 Stokes Croft/Cheltenham Road/Gloucester Road (turning off onto the lesser Filton Avenue for a shortcut). Just a normal British urban arterial ‘A’ road, 2 lanes + 2 bus lanes where room permits, dozens of buses in peak hours, car parking in the off peak hours, row upon row of shops and houses and little residential side roads. 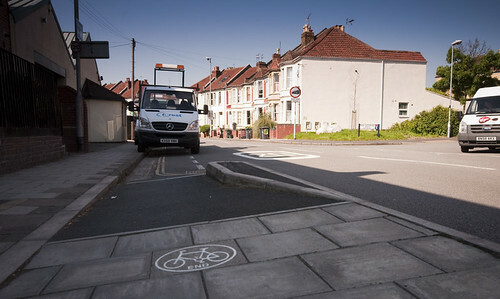 Occasional token painted 1.2m advistory cycle lanes, of no use to anybody under the parked cars. We headed back on a new Cycling City funded cycle route, Concorde Way, on about 50:50 residential backstreets and 3.0-3.5m shared paths. The route is not bad. Nowhere near modern Dutch standards, obviously. There are a couple of little fiddly bits with toucans and pavements. There’s a street that’s used by motorists as a ratrun. There are paths as narrow as 3.0m shared between pedestrians and cyclists, despite this being a densely populated urban area. There are paths even narrower than that, briefly, where they reuse the 1970s subways under a motorway junction. There’s a new home zone built on a through trunk cycle route. I wish it were better, but I congratulate its designers for doing so well against all the odds, fighting the rules of British Highways engineering all the way. Aforementioned pinch points aside, it’s not too narrow, it’s not too slow, it’s not too unsafe, it doesn’t ever abandon you. It has advantages, like avoiding all the traffic signals you get on equivalent main roads. It’s a 5km cycle route that works the whole way, and which is enabling people who would not otherwise get around by bicycle to do so, while at the same providing a route that confident and speedy cyclists won’t turn their noses up at. In that sense, this might look a bit like a case of unravelling routes: putting the cars somewhere else, where they can’t bother the people on foot and on bicycles. But that this is far from having been satisfactorily achieved is illustrated by the fact that that there are at least as many people on bicycles on the old main road as there are on the dedicated cycle route. Because the cycle route’s one really big flaw is that it isn’t where most people want to be. It runs through a park by a river, through allotment gardens beside the railway cutting, across the wasteground underneath the electricity transmission lines and past the rugby practice field. Politically easy to achieve and physically easy to build, in places where there is little competition for the space. Whereas the main road runs past the shops, and the offices, and all the houses. And so it appears that this is less like unravelling routes and more like dual networks: the idea that if you just put a basic cycle route on back streets and traffic-free paths to enable children and the less confident to train themselves up, eventually they become confident enough to man up and take the lane with the trucks and buses on Cheltenham Road. The difference is that in most other cases, the quality of the cycling infrastructure is cut to a bare minimum and then cut some more (because it’s just a training network, so what do things like directness and speed and comfort and capacity and actually going somewhere matter? ), whereas this one is genuinely good and useful and nice, if you happen to be going in that direction. It’s great that Bristol has built this, and the several other similar new arterial cycle routes. I don’t blame them for going for this stuff instead of the main roads at this point in time. 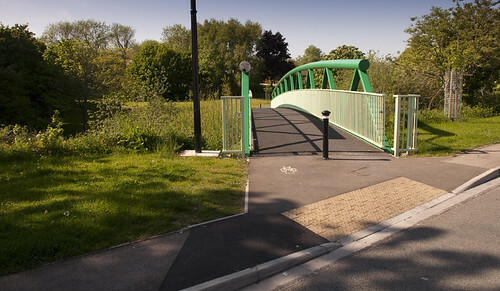 It’s the politically easy low-hanging fruit of paths across parks, derelict railway corridors and wasteland; and the relatively cheap quick wins of filtered permeability and little paths and bridges here and there to join up riverside paths and quiet streets into longer routes. Of course you’d do those things first. But the lesson from the Netherlands — who did all the experiments for us, decades ago — is that routes like these will only buy you so much modal shift, and they can’t deliver a whole Cycling City. For most people, if the cycleway doesn’t go where they’re going, they won’t cycle. What really starts to deliver impressive numbers is enabling cycling for all, not just the unusually confident and tolerant few, to ride on that main road, the one where the shops and the offices are, the one with all the residential streets running off it. And what really makes a Cycling City is not routes but a network: if people are to routinely pick the bicycle over the car without thinking or planning, they need to be confident that whatever their journey, especially those to places they’ve never been by bicycle before, they’ll be able to just get on and go without fear of being dumped in traffic on a dual carriageway or multi-lane roundabout. There is one more artery in this story: the M32 motorway. I wrote about it before — how parks were paved over, railway viaducts blown up, and inner city neighbourhoods bulldozed as it was thrust into the heart of the city. After all the destruction it brought in its path, the final tragedy was that, far from being designed to relieve the old arteries and streets of traffic, allowing the likes of Gloucester Road to be reclaimed from the passing motorist by its residents and shoppers, the motorway was designed to pump an ever greater volume of traffic onto those streets. But it would not be at all difficult to start fixing that mistake — to reclaim the space needed for cycling on the main arteries by sending motorists to the motorway. Which is the point I’ll get to in a future post.